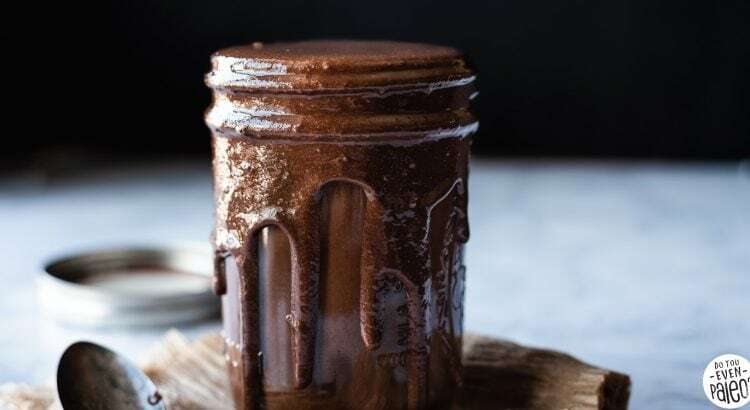 Glossy and luxurious, this dark chocolate tahini spread is like getting a text from your love or bestie telling you how awesome you are. It’s guaranteed to brighten up your day and make you smile! After my paleo tahini chocolate chip cookies recipe from earlier this year, I kept exploring the sweet possibilities of sesame seed paste. What other ways could I turn this somewhat bitter seed butter into a decadent treat? Turns out I didn’t have to explore very much. 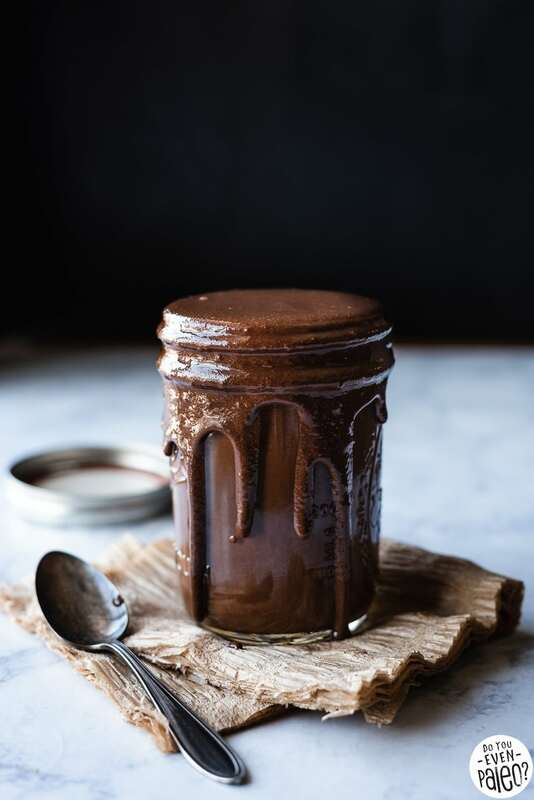 By adding just a few ingredients to tahini, you get this simple paleo chocolate tahini spread. 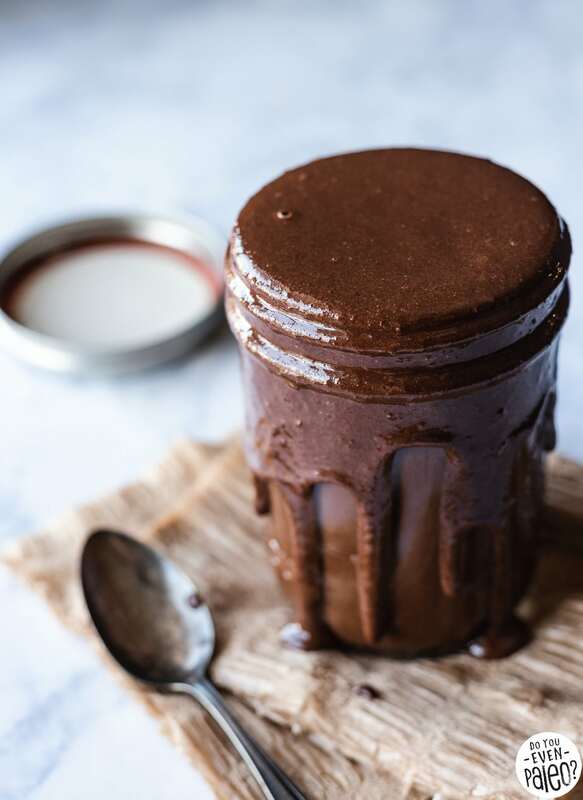 A paleo, gluten free, keto-friendly, vegan seed butter treat that’ll have you dunking your spoon again… And again… And again. You know how chocolate and hazelnut make an awesome combo? Well, I’m happy to say the same holds true for just about all nut and seed butters. Especially tahini! 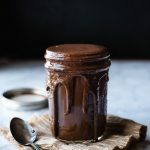 This chocolate tahini spread recipe has been on my recipe ideas list for a good long while. 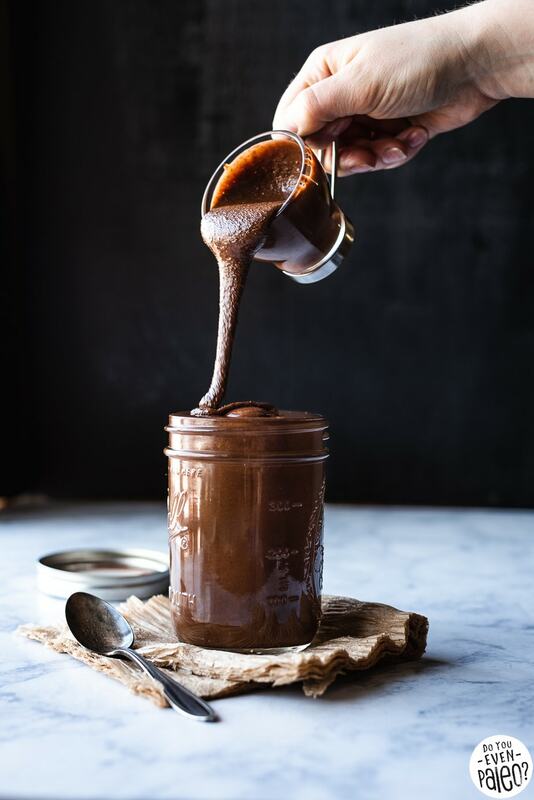 Waaaay back in the day, I got my hands on a chocolate tahini product, and it was amazing…but absolutely bursting with sugar. I wanted my version to not only be paleo, but cut down on the sweetness a lot. And I succeeded! I daresay I like my homemade version better. 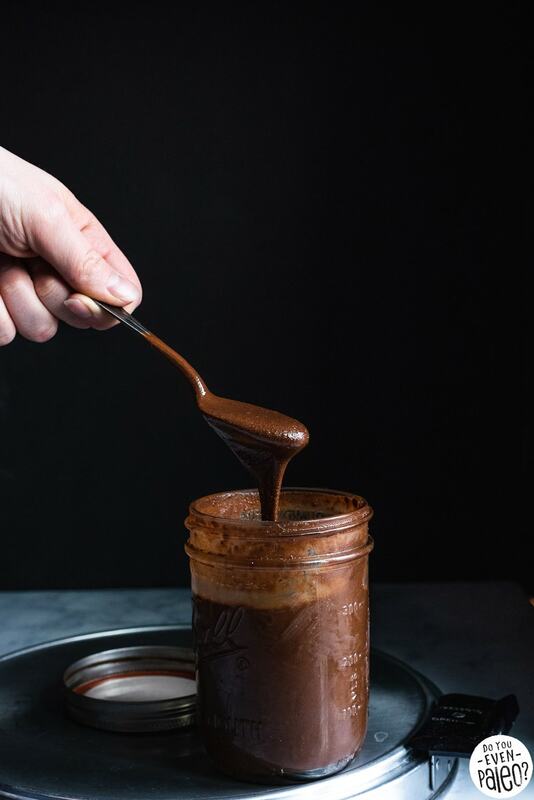 Not only it is not too sweet (this is a dark chocolate spread), it’s also super smooth. Like, dangerously smooth. 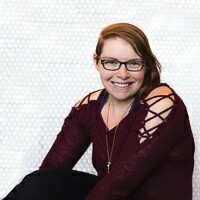 And don’t worry, I’ll tell you exactly how to get your tahini that way. Frankly, my tips work for all nut and seed butters, so you’ll be able to take this recipe and run wild with it. Oh, and if my “not too sweet” isn’t nearly sweet enough for you? Feel free to add more coconut sugar, a tablespoon at a time, until you hit the right amount of sweetness for you. Just keep in mind that you’re not trying to cover up the unique flavor of tahini. Instead, the slight sweetness should just enhance the overall treat. Also, the more coconut sugar you add, the less smooth your tahini will be. You could separately blend your coconut sugar into powder, but who’s got time for that? Anyway, I’ve found that after setting for a day or two, the coconut sugar tends to dissolve on its own. But I haven’t tested that with extra coconut sugar! To make truly awesome nut butter creations, there’s one tip you have to keep in mind. You can’t just add everything to the blender and blend. It rarely ever works! Instead, add it all later and blend just until incorporated. Sonia, the Healthy Foodie, taught me this trick in her cookbook Paleo Home Cooking (which is marvelous, by the way). Water is the worst enemy of incredibly smooth nut and seed butters (water and oil don’t mix! ), so introducing outside moisture from additional ingredients while blending can cause the nut/seed butter to seize up! Your best bet is to mix the extras separately, then add to the blender after you already have perfect tahini texture. Give it a quick blend to pulverize that vanilla bean and mix all the ingredients. 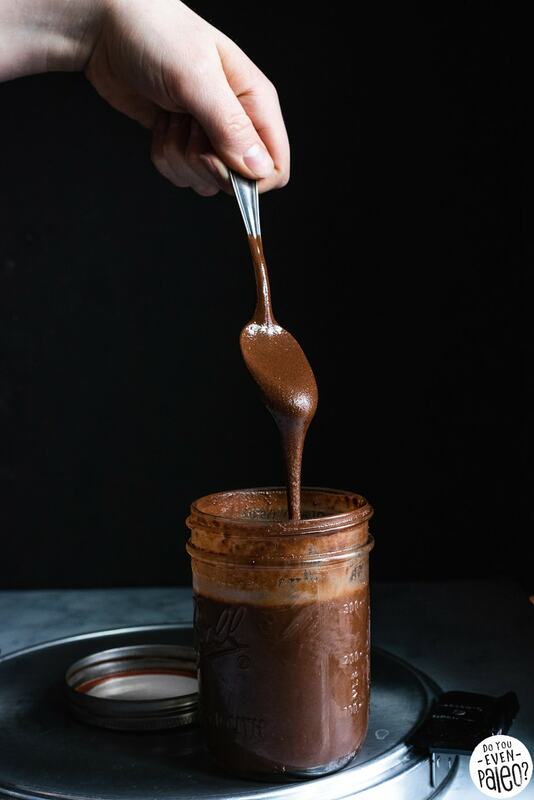 And you’re left with perfectly pourable, luscious chocolate tahini spread! Preheat oven to 350 degrees. Spread sesame seeds on a rimmed baking sheet and toast for 8 minutes, stirring halfway through. Add the toasted sesame seeds to a high powered blender or food processor. If you’re using a Vitamix, start on low and increase speed very slowly over the course of 8 minutes. Blend until super smooth. If you’ve ever made nut butter before, you know this can take quite a while! See THIS POST for more tips. Meanwhile, add the cocoa powder, sea salt, coconut sugar, and avocado oil to a medium bowl and stir until a thick paste is formed. Add the cocoa mixture and vanilla bean to the tahini and blend until smooth. Store in the fridge, as sesame seed oil can easily go rancid. In the fridge, it will keep for months! 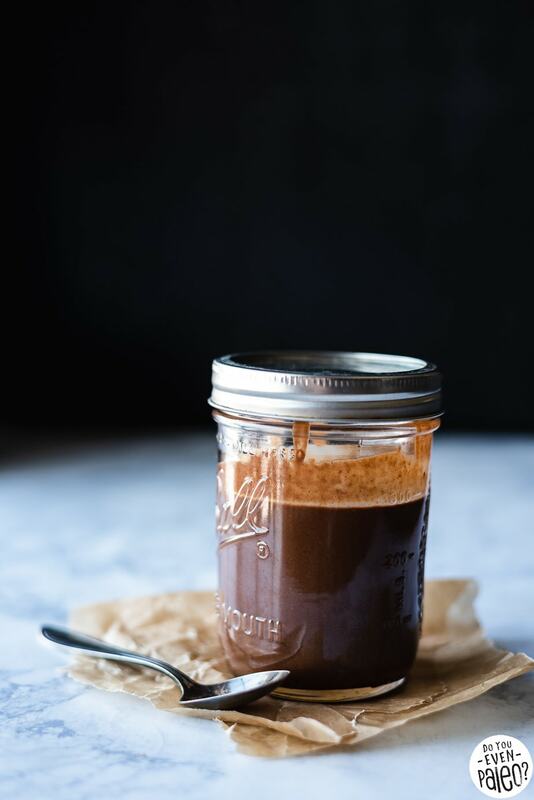 Don’t want to make your own tahini? Just skip the first step and use 2 cups of store-bought tahini. Don't subscribe All Replies to my comments Notify me of followup comments via e-mail. 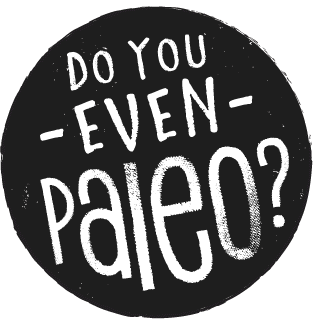 You can also <a href='https://www.doyouevenpaleo.net/comment-subscriptions/?srp=3963&srk=87505361eee98908ddf6ccb8681f50d6&sra=s&srsrc=f'>subscribe</a> without commenting.